In the midst of my happy news, I took the kids to our orchard down the road. Everything is down the road when you're out here. We knew our goal: apples for my grandmother's apple cake, our family's fall tradition. If you follow me on twitter, you may remember me going on about it as it baked in the oven. The scent alone, makes me feel like my mother, sister, aunt, and grandma (all who use this recipe) are at my side. That's some powerful kitchen magic! My grandmother raised three children, ran the household, and directed a school within her home. A fabulous cook and busy woman, she knew the beauty of this recipe was the ease matched with such delicious results. So if you're looking for some simple and satisfying baking this weekend, this is it. * Bonus: very fun opportunities for the entire family to help. Peeled apples, sliced in half & face down, can be cut with butter knives by smaller children. Into large bowl add diced apples and sugar. Let stand for about 15 minutes. Pour in oil and egg. Stir. Add vanilla and walnuts. Stir. It will be quite stiff, don't worry. Pour into a well greased and floured 8 inch square pan. Bake for 45 minutes @ 350 degrees. Cool in pan for 10 minutes on a cake rack. Dust top with confectioners sugar before serving. -I always double the recipe (otherwise, we have to make it again the next day). -We omit nuts...my kids don't appreciate them the way I do. -I only peel the apples if there's time. No one seems to care either way. 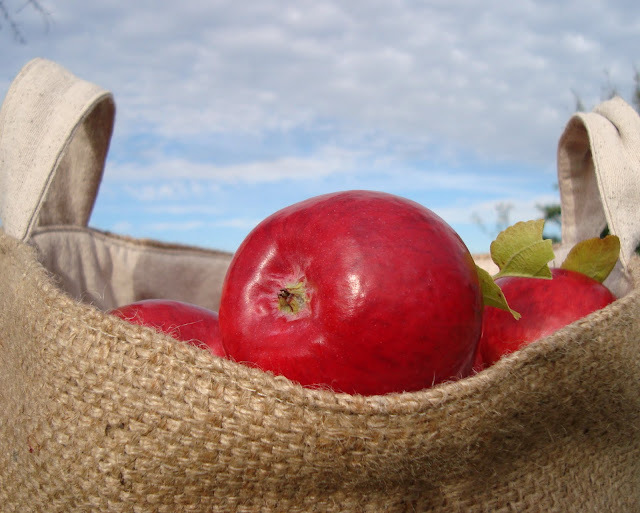 Those apple are so red and gorgeous! And the cake looks fabulous. Love the brilliant and yet soothing colors in your photos. Thank you for sharing the cake recipe. One bowl and no peeling the apples, hooray! Wishing you a lovely weekend! WHat a lovely coincedence.. As I was putting my 3 to bed just then, we were talking about weekend things-to-do, and baking a cake was top of the list. Apple cake it will be! With many thanks to your grandma..
OH MY, yum, that cake sounds fantastic and that apple tree, WOW. That cake looks fantastic! I need to make it for my Tuesday Quilt Group and it needs to be larger. So, when you double the recipe do you just use a 9" by 13" pan and bake it for the same amount of time or can you put it into a bundt pan perhaps and bake it longer? This is a must make for me as I love apple cake. I just made an apple crisp last night with our gorgeous and HUGE apples. I think apple baking could go on all fall, though. I suppose I'll *have* to try this over the weekend...maybe for breakfast?! 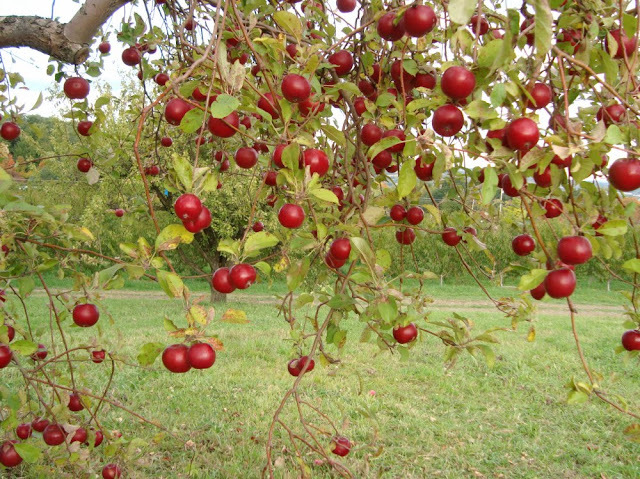 what a fabulous apple tree with even better apples! oh the colour! and the scent of apple pie is one you can't live without isn't it? I'm so glad you shared the recipe. Your Grandmother sounds like an amazing woman and the thought of making this recipe makes my mouth water. Cheers! Those apple trees are magically red! Funnily enough, we just made your apple gingerbread recipe yesterday! My daughter has been home sick all week, so a baking day was in order. That gingerbread is the best I've had in a long time. Thanks so much for sharing. Can't wait to try this one tomorrow! What is the oven temperature? I don't see it. Isn't that tree amazing! I couldn't choose any other tree for photos. I'm not even sure the variety or I would have shared. The u-pick orchard we go to is sprawling and filled with some of the oldest apple trees in the area. There are rarely farmers around on weekdays, so we're on our own. We go from tree to tree tasting and deciding which we want to bring home. Oven temperature! Sorry for that omission. Preheat and bake at 350 degrees. I'll go edit the post right now. Thanks for catching that knit-R-done. Karen L. When I double it, I've put it in a 9x13. This time I made a tiny cake (for faster baking and instant eating) and a round cake in a 10 inch spring form. My kids were a bit overzealous with the sugar dusting on the round cake pictured. leaves and feathers: funny how long it took for me to catch on that we didn't have pine for more so soon if we doubled the recipe. Years of not realizing! :) Happy birthday to your son! what an absolutely lovely tree, we don't grow apples nearly that size here! they look so delicious! you are evoking memories of my mothers apple pies so tall they were and full of apples from the tree in our backyard. Always tart green apples and cinnimon. Beautiful photos Maya, you have captured a day wonderfully! That cake looks delicious, it will be being baked and going into my cookbook(which is actually a hard back sketchbook)! Oh!! What a wonderful image. This apples tree is so gorgeous. I'd like to eat one of them. Here in Brazil, in the region where I live, is not so cold (10ºC in the winter) and the apple trees produce few apples (10 or 20 a year). Do you have a recipe of apple pie? I'd like to do one like the Donald duck's grandmother has done in the comics. Do you understand me? Sorry, my english is not so good. On the list now of my cakes to make! Aren't Grandmothers wonderful? Also love the unique photos of the trees... Do you happen to know the varietals? Yum, I can almost smell it baking. 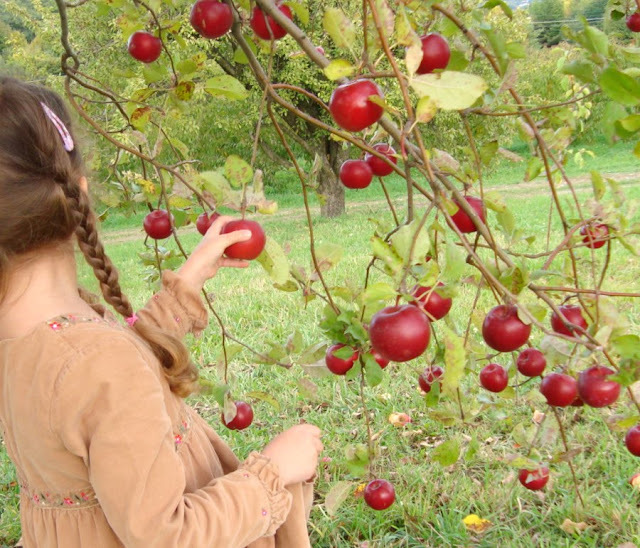 What beautiful photos of that apple tree, it's gorgeous. You have your priorities right and your love for your family and your life makes your blog a treat to visit. Your apples look beautiful. I bought honey crisp apples at the farmer's market for the first time this year and they were the best I'd ever eaten. Yumm! The cake looks delish. Thanks for the recipe. I read your blog this morning and the cake is in the oven as I type. The smell is wonderful. Thanks for the recipe. I just read this post and before I even came to the end of it I was already mixing up the first ingredients! =) The cake is currently in the oven and looks great! Thanks a lot for the recipe - I'm sure it'll taste great too. Oh, my! Those apple trees are beautiful! So lovely! Look at those glorious red apples! A treat for the eyes, let alone the mouth. This is what I have been looking for to give to my husband to make (although I'll do it today). He is well known by the family at our local orchard because he can't wait for the first apples every year. We made an apple pan dowdy from an old recipe but it had a lot of butter and no egg or soda. I think he'll love your recipe. Thanks. I look forward to following your blog. I've made this fabulous cake this afternoon and it's...délicieux ! I made this wonderful cake last night, and oh, it was perfect! And I love knowing it's a family tradition that evokes all sorts of memories. I made this for my family this weekend! I used almonds instead of walnuts and it turned out great! I LOVE your apple photos. My Alaska island is very nice, but it is a shame there are no orchards here. Perhaps I'll embolden the brave little baker to try out some apple cake with Washington apples hot off the barge. Thanks for stopping by http://starboardport.com! Your cake recipe is fabulous. I made it yesterday, and you are right - not enough. Should have doubled the recipe. Thanks!! I made this cake last night with honeycrisp apples and got to have some for breakfast this morning. It is fabulous!!! Thank you for sharing it. It's 4:00 in the afternoon in Berlin - time for Kaffee und Koechen - coffee and cake. Guess what cake we're having! It's a huge hit over here, so thank you. Absolutely envious of those apple trees in your photos. And...I'm so jealous of apple trees which low-reaching branches. 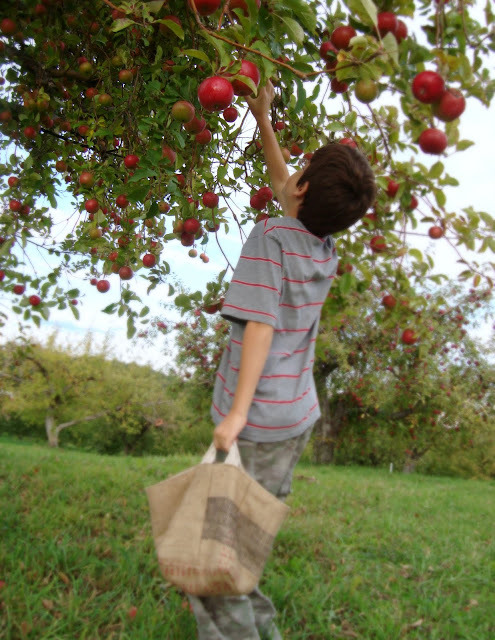 In our neck of the woods you have to tote a ladder to reach 'dem apples. You've inspired me! I left work early yesterday, swooped up my daughter and took her for her first apple picking adventure. It was delightful...and just what I needed. Tonight, we shall feast on our spoils by trying that fabulous looking apple cake recipe! As I told you on twitter - I had planned on making this over the weekend but JUST got around to putting it into the oven a few moments ago. Yum! i want to yell from the rooftops "i just ate the most incredible apple cake in the world!!!" oh man. we went picking today and made the cake for dinner dessert (tomorrow it will be breakfast dessert). this recipe is being added to my favorites to make often. thanks. made your cake today - seriously yum! I also got my moleskine journal in the post - what a yummy day! This cake is getting some serious love, and my family couldn't be happier! Made this cake last night....PERFECT. It tastes like a grandmother recipe, and our little 2 year old friend was equally smitten. Hope you get to read this comment as I wanted to let you know that I did make your Grandma's one bowl apple cake for my Tuesday morning quilt group this past week and they loved it! Several asked for the recipe so I will pass it on with your name/blog attached. Thanks for sharing that wonderful cake! I can't believe how much love this recipe is getting! Well, yes I guess I can! Karen L. I read every single comment, no fear. So glad everyone in your quilt group enjoyed it! This is the best cake ever and the recipe I've been looking for for my family. We are "apple people" and my husband starts haunting the orchard in mid summer to see how the season is shaping up. Everybody loved this recipe, even the fussy kid. Thanks. Hi Maya! I just made the most wonderful apple cake using your recipe. Much thanks for sharing! Have a lovely day and keep those lovely posts coming. What a tribute to your Grandmother to have so many people make her delicious cake! We made some tonight and it was PERFECT!!! I was going to do the 9x13 pan, but since it was really for our small group from church tomorrow night, I did 2 8x8 pans. That way we could dive into to one tonight. I am embarrassed to say it is 1/2 gone! thanks for the suggestion about using the butter knives...my boys loved cutting all of the apples once I peeled and cored them! yum!! Yum! I just made the One Bowl Apple Cake. It is sooo good. I am trying to save it for school snacks this week, but I keep taste testing it! I found your recipe via The Artful Parent. We have a huge bowl of apples wondering what I will do with them - now I know the answer. Thank you for sharing your grandmother's wonderful recipe with us! I made this today and it was well received by our playgroup! So yummy! Thanks for sharing the recipe. I'm sitting here with my first slice in front of me. It's delicious! I'm so glad I doubled the recipe. thanks for the cake recipe. We were having company for dinner, so i whipped it up right away. I added pears and cranberries with the apples. It got rave reviews. I'm most impressed with the colour. Was wondering how it would turn brown. Guess it's the cinnamon? And I love that it's one bowl. Don't like dirty dishes, me. This is the best apple cake! I've been making it every weekend for the past month because it is that good. I add a little extra cinnamon and dont add the nuts. So simple! Thanks for sharing it! seriously this cake takes me right back to my grandmother's kitchen...super tasty. i gave your recipe a shout on my blog. thank you for a flashback to my childhood. 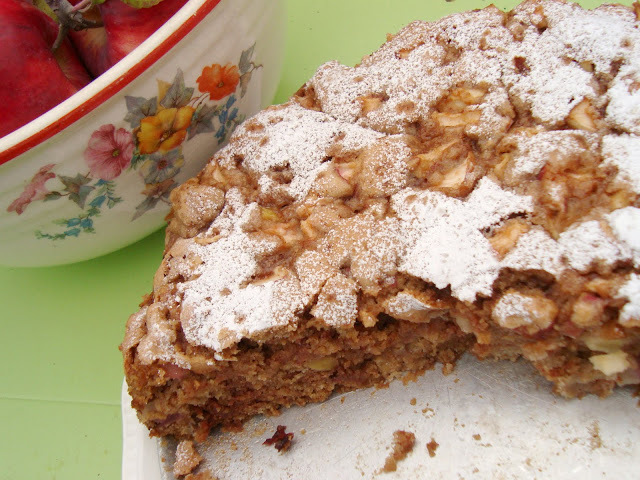 What a delicious recipe :) I didn't add nuts either bit I would if I had them on hand. I also added 1/4 cup Bulgarian buttermilk and did 3/4 cup white sugar and 1/4 cup brown sugar. Thanks for sharing! I was wondering can I use baking powder instead of baking soda? Pinning AND doing :) for sure !! YUMMY! We were a little over zealous when picking apples, now I'm trying to use them all up. Was looking for something a little more simple than a pie. This is PERFECT! Super easy, super yummy. Thank you! Thanks for the recipe! Is this missing baking powder? I see the soda and I'm assuming all-purpose flour? :) Thanks! The first time I made it, it was YUMMY as all said, but it took much longer to bake. I thought it was since I baked it in a round glass pyrex. Today I used the 8 x 8 and wasn't as careful to make sure it cooked through. Even though I baked it 15 minutes longer than recommended, it still was not completely baked. (I also used baking powder the first time in error and "corrected" this also with the baking soda the 2nd time). Not sure exactly what I did wrong the second time. Have others had problems with the baking time?? Ever since I found this recipe a few years ago, I've been making a dozen+ of these cakes each fall after going apple picking, and freeze them to have on hand all winter. I follow the recipe exactly (though always tripling it), and the cakes come out perfectly every time. They also freeze and thaw beautifully. Thank you! !